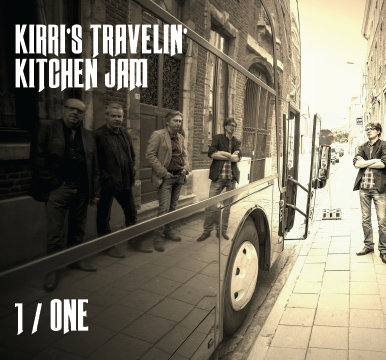 Kirri’s Travelin’ Kitchen Jam’s second EP presents 8 brand new songs about the joys and burdens of life, composed by multi-instrumentalist and singer-songwriter Kris Valvekens in a mix of acoustic pop and blues. 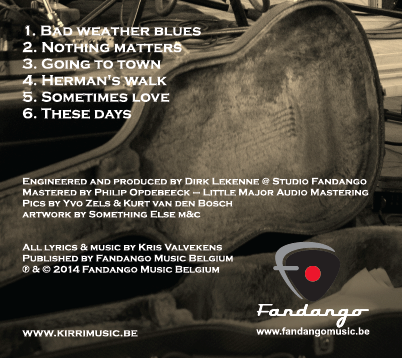 Dirk (Studio Fandango): “All we needed for these beautiful songs was acoustic guitar, blues harp, percussion and an occasional dobro. And Kirri’s voice, of course, which really resembles that of Neil Diamond. The result: pure roots music. The EP “Little Somethings" is available through the studio upon request, via iTunes and all other digital stores. This first EP presents 6 brand new songs of multi-instrumentalist and singer-songwriter Kris (Kirri) Valvekens. The mixture of rock, pop, blues, swing, zydeco and funk first takes you to New Orleans and ends up in the nightly parisien streets. Kirri’s Travelin’ Kitchen Jam is composed of 4 men that have long deserved their credits: Kris (Kirri) Valvekens (vocals, electric and acoustic guitar, lapsteel, mandoline and bluesharp), Marc Steenbergen (piano, organ and backing vocals), Erik Hermans (bass and backing vocals) and Johan Asselberghs (drums). Kirri is blessed with a voice resembling that of Neil Diamond, which gives his music an “americana feel” and takes the listener through different musical scenes. The album "1 / ONE" is available through the studio upon request, via iTunes and all other digital stores.